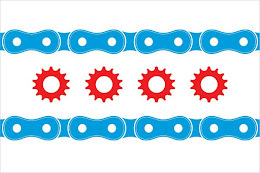 Chicago Bicycle Accident Lawyer | Illinois Bicycle Lawyers at Keating Law Offices: German suburbs opts to be "Car Free"
German suburbs opts to be "Car Free"
There is often an ongoing conflict between avid bicyclists and the status quo that accepts (if not altogether embraces) automobiles. At the heart of this conflict is a belief that the world might be better off with fewer automobiles and more bicycles. In Vauban, Germany, the city planners have created such a world. Cars, driveways and garages are all banned in this experimental small town. The New York Times has an article on Vauban that you can find here. The town is set up much the same way that Daniel Burnham envisioned Chicago when he made the "Burnham Plan." Burnham's idea was that neighborhoods would be set up with major retail/industrial streets, and then be divided and subdivided by smaller streets that had local shops and taverns, all within easy walking (or biking distance) of any individual home with a neighborhood. After World War II and the emergence of the middle class and more affordable automobiles, America saw cities explode outward into the suburbs and society became more and more reliant on their cars and trucks. As a legal matter, litigation over automobiles and automobile-related accidents has caused a massive increase in litigation. Unfortunately, in the modern world, many (if not most) of the people that are injured because of automobile accidents. It is not a stretch to argue that fewer cars and better urban and suburban planning could lead to fewer injuries and fewer lawsuits.